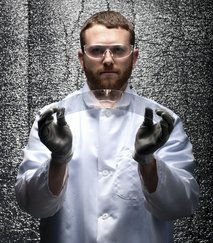 Back in 1962 corning came up with a super strong glass. Stronger than pyrex but marketing it was a bit of a problem. Back when it was develoed Corning was looking for a glass that would be as strong as steel. What was created was called Chemcor and it was used for car windshields and sunglasses but rival companies were able to compete with lower priced options. When LCD screens came into play Corning was the go to manufacturer to supply the needs of the Japanese electronics companies with their soda lime glass. This was used for laptops and TV screens. Not long ago Chemcor was brought out and dusted off, as well as renamed Gorilla Glass. Not only is it very hard to break it’s scratch and dent resistant too which makes it perfect for handheld devices such as iPhones and other 3 and 4G devices. Corning’s stock price has increased a bit on this news. It will be interesting to see what comes of this…and what’s the melting temperature so we can use it for art too?